Somewhere, we all will have heard about Welding. It is a technique that is used to join metals. Welds have their specific properties. It is very much required whenever there is construction going on and something like this. It is one of the best methods to join metals pieces in a definite way to get what we want. Welding is not the one process that is done when metal joining is done. Various processes are done before and after the welding. For example- to make an iron gate, first, you have to cut the metal into certain shapes and sizes on which welding will be done. After that machinability is done for smoothness and surface finish. There are different methods to do welding. There are different types of welding for different metals. All welding techniques have their unique features, and all have their pros and cons. There is a particular procedure to do welding i.e. to move the stick or torch on the metal. If you do wrong, results won't be good. There may be some strength issues or finishing issues. There is not much to study. Just read, understand and practice the techniques and you can do it on your own. All metals have their unique properties. That's why different types of welding types are there. Now we will discuss two important types of Welding Techniques. First one is MIG welding and the second one is TIG welding. MIG stands for Metal Inert Gas welding, and TIG stands for Tungsten Inert Gas. MIG: This welding technique is prevalent, and it is most commonly used. In this technique, electricity is used between the electrode and the metal. It is also known as arc welding. This is because when welding is done, an arc is formed between the electrode and metal. It is cheap and durable. This welding technique is less precise, but it works well for long runs. That's why I have used the word durable for this technique. When this welding is done, sparks fly here and there on the metal piece, and it is a mess. We would have to clean this up when grinding is down the weld. It is economical as compared to TIG. TIG: It stands for Tungsten Inert Gas. This technique requires a lot of skills and precision. It can’t be done by everyone. Getting is good weld is not easy as compared to MIG welding. It is also known as Gas Tungsten arc welding. It is generally employed for the fabrication of thin structures. In this, an electric arc is generated between the base metal and tungsten electrode. After that, a suitable filler wire or a rod is used as a filler. It is introduced in the weld pool. You get high quality and precise welding joints. It is used for exotic materials. Just select proper welding rods or wires, and you are good to go. With the help of TIG welding, you can weld most of the common metals or alloys such as mild steel, stainless steel, Titanium, Aluminium, and copper. Now let’s talk about MIG gloves and TIG gloves. MIG Gloves: MIG gloves have a pad at the rear hand position which is generally thick. This is for protection for a standard MIG hand position and welder can easily rest the back of the non-dominant hand against the piece of work. Thumbs will be up in this position. In this way, this padding also protects the non-dominant hand while working. Due to this design, you can easily throw off a glove when it becomes too hot. 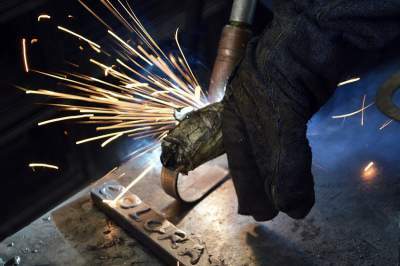 You can't easily move fingers, but it is okay in case of MIG welding because this technique relies on the wrist rather than little fingers movements. This glove offers a decent protection for your whole hand. These gloves are loose fitted. It's because they can easily be overheated and as they are loose, a glove can be flung off with one hand. TIG Gloves: These gloves are smooth and are made of a much thinner mixture of leather and fire- resistant fabric. These gloves are opposite to MIG gloves i.e. fit and easy finger's mobility. In TIG technique, each palm faces the weld pool, so the back pad is useless. A correct balance and work of the torch and filler square are needed for TIG. These gloves can be used for low power MIG fastening, but it is not recommended. The backs of these gloves overheat quickly. These gloves are made from leather or a combination of fire- resistant fabrics and leather. Each material has its flexibility, toughness, etc. different materials are used to take advantage of these qualities. MIG gloves are made from cowhide or pigskin for higher durability whereas TIG gloves use deerskin, goatskin, or fire-resistant fabric for a lighter, more fitted glove. You can safely switch the type of glove you use according to the circumstances. Let’s say, if you are performing a high-powered TIG weld, then you should use MIG gloves to better protect against sparks. Sometimes MIG is done on small parts in which precision is required. So TIG gloves can be used here. While choosing gloves, remember that MIG gloves may hinder finger movement whereas high heat and constant sparking may damage TIG gloves. We have seen some great things about MIG and TIG. Both are good in their ways. When we talk about gloves, choosing a glove depends on the task being performed. There are many materials from which these gloves can be made. Some of these are Leather, Goatskin, Horseskin, Pigskin, Cowhide, Deerskin, Elkskin. Care should be taken while welding. Working temperatures are extremely hot. One more thing, while welding, always wear a protective glass for your eyes. Direct exposure of welding light can harm your eyes. So be careful.